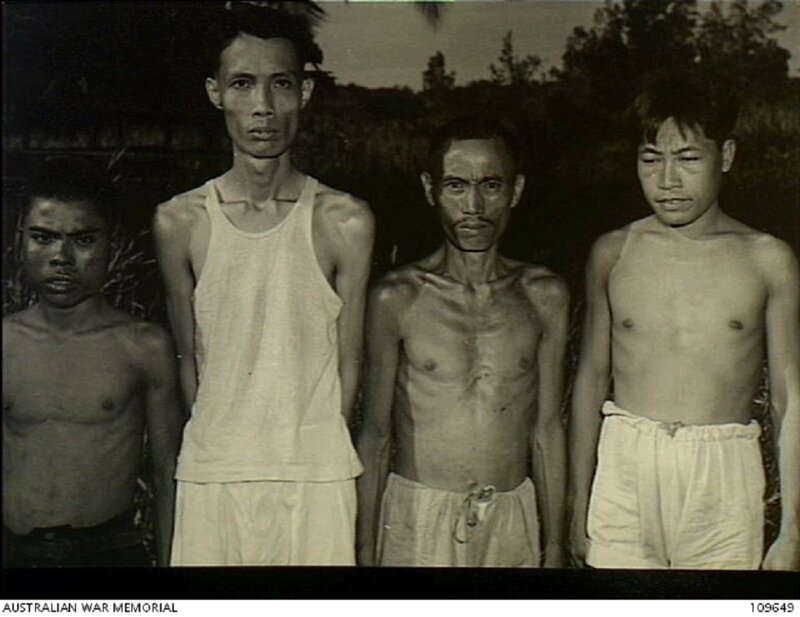 Four of the surviving natives found by an Australian platoon in a Japanese internment camp at the Gadong School. Of the 60 natives who had been in the camp, 23 were taken by the Japanese, 37 released by Australian troops, 5 were found dead, 14 June 1945. Image courtesy of Norman Bradford Stuckey, Australian War Memorial. This trial involved eight soldiers from the Kempeitai section of the Imperial Japanese Army stationed in British Borneo (present-day Malaysia). They were accused of multiple war crimes such as ill-treatment by forcibly removing residents and unlawfully killing several residents including women and children. These incidents occured on the Mantanani and Jesselton Islands, Penampang, Telipong and Mengattal areas. At the end of the trial, two officers and one sergeant major was senteced to death by hanging and life imprisonment respectively, despite arguing that they were acting under orders from their superiors. The remaining defendants were sentenced to varying lengths of imprimsonment except for three soldiers who were able to prove that they were not present at these locations at the material times. 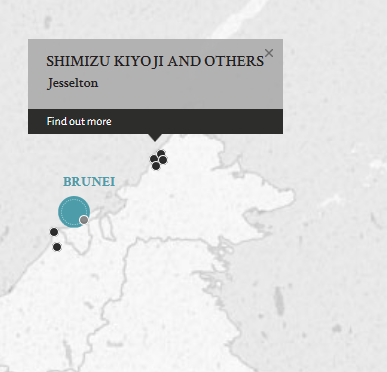 The Japanese soldiers involved were responding to the 'Api Incident', where approximately 400 Chinese and natives from small islands around Jesselton rioted and killed almost 50 Japanese including women and children. In other words and in their defence, they executed their orders to restore peace and stability to the region against the backdrop of an impending Allied invasion. Shimizu, Kiyoji. Second Lieutenant. From Japanese military. From Japan. Guilty (First, second and fifth charge). Death by hanging. Sentence confirmed. Furuno, Junichi. Warrant Officer. From Japanese military. From Japan. Not guilty (First charge). Nukushina, Yoshita. Warrant Officer. From Japanese military. From Japan. Not guilty (First and second charge). Kiuchi, Haruo. Sergeant Major. From Japanese military. From Japan. Not guilty (First and second charge). Uchiyama, Chokichi. Sergeant Major. From Japanese military. From Japan. Guilty (First, fourth and seventh charge); not guilty (Second charge). Life imprisonment. Sentence confirmed. Mukai, Heihachi. Sergeant. From Japanese military. From Japan. Guilty (First, second, fourth and sixth charge). Death by hanging. Sentence confirmed. Fuma, Akira. Sergeant. From Japanese military. From Japan. Guilty (First, second and third charge). 15 years' imprisonment. Sentence confirmed. Inaba, Keishi. Corporal. From Japanese military. From Japan. Guilty (First and fifth charge); not guilty (Second charge). 6 years' imprisonment. Sentence confirmed. Ito, Hitoshi. Public Prosecutor in Korea. Bosfield, K.R. Captain. From British military.